Home > Episode 357: Can The Force Awakens Make $2 Billion? 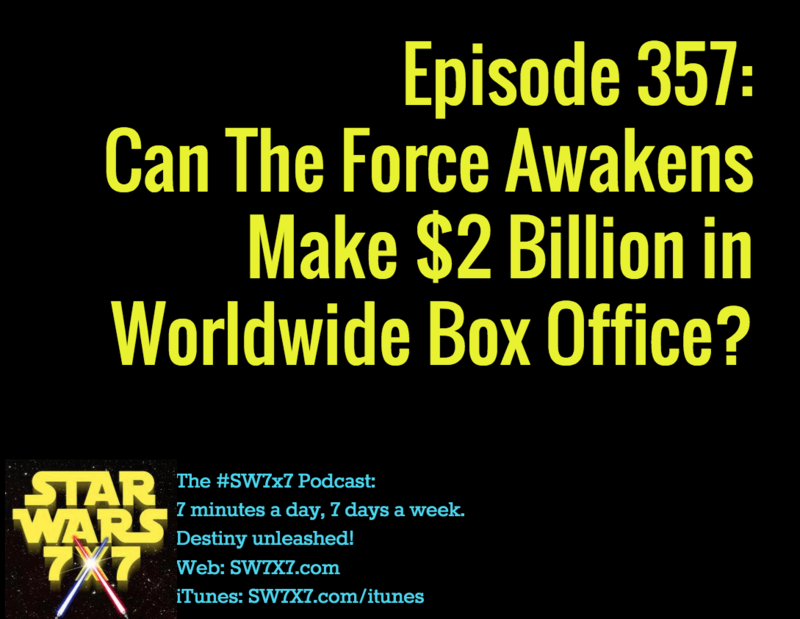 Episode 357: Can The Force Awakens Make $2 Billion? This year has already seen three movies crack the top 20 list of highest-grossing movies of all time: Furious 7, Avengers: Age of Ultron, and Jurassic World. The final movie in a series usually performs very strongly, so there’s a decent chance The Hunger Games: Mockingjay Part 2 will crack the top 20, too. But what about The Force Awakens? Well, an analyst at Morgan Stanley (they analyze box office stuff?!) just revised his estimates 22%, and now claims that The Force Awakens will make $650 million domestically and $1.3 billion worldwide, for a $1.95 billion total haul. What do YOU think? Could it top $2 billion? Could it topple the #1 movie, Avatar, at $2.7 billion and change? Let us know in the comments! On this date, filming began for Episode I in 1997 and Episode II in 2000. Which reminds me – isn’t it about time we heard something about filming beginning for Rogue One? Let alone a bigger cast announcement? What the heck is going on??? Star Wars Stainless Steel Pendants – Boba Fett or Stormtrooper helmets, Rebel Alliance Starbird, or TIE Advanced x1, click the pic for details and to get yours! Today’s question: What did Han tell C-3PO to hope for, before leaving to rescue Leia on the first Death Star?